You are here: Home » Blog » Da Dong Prawn Noodles – Prawn Noodles that will have You Coming Back for More! 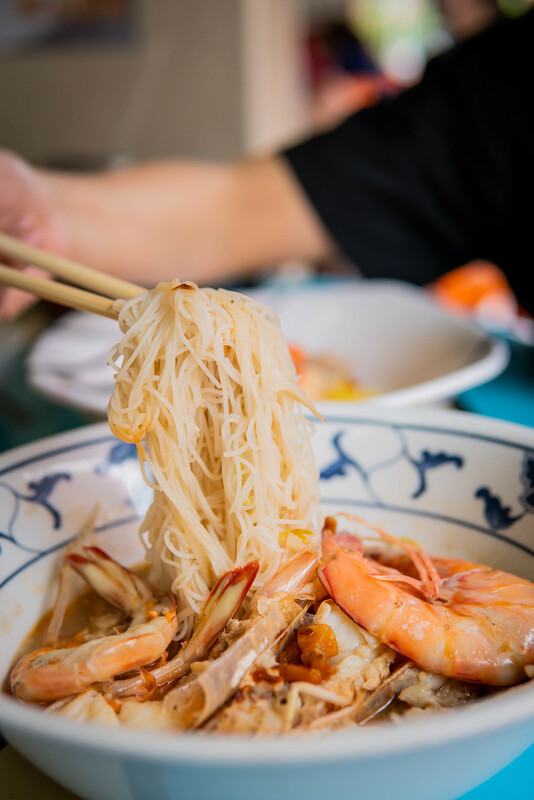 If you are in the mood for a mean bowl of prawn noodles, then you have to head to Da Dong Prawn Noodles! 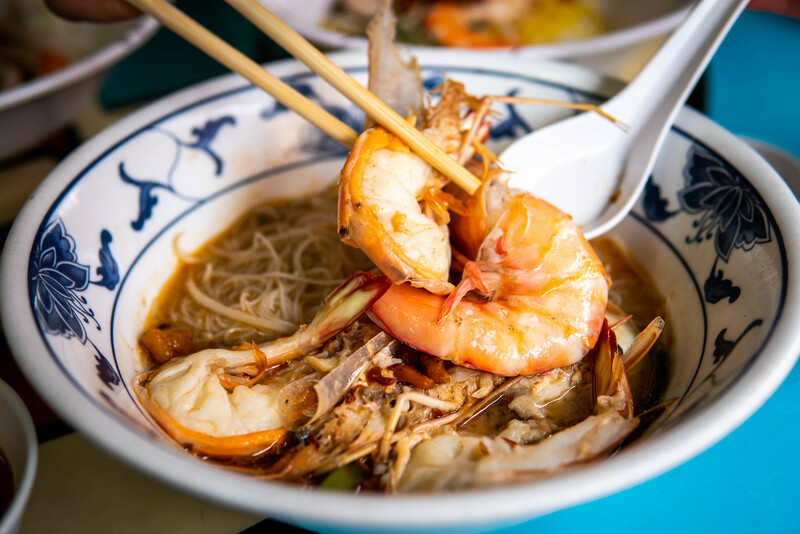 Located in Mellvin Coffeeshop along Joo Chiat Road, Da Dong Prawn Noodles has been around since 1966. 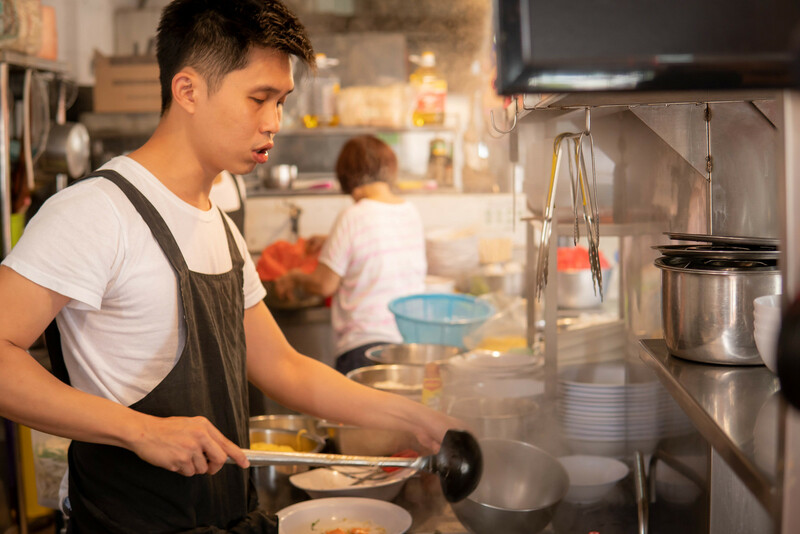 Now, at the helm of it all is Watson Lim, a rather dashing 31-year-old 2nd-generation hawker who has decided to take over the reins from his father. Da Dong Prawn Noodles serves prawn noodles in 3 different sizes: small ($5), regular ($8), and large ($10). 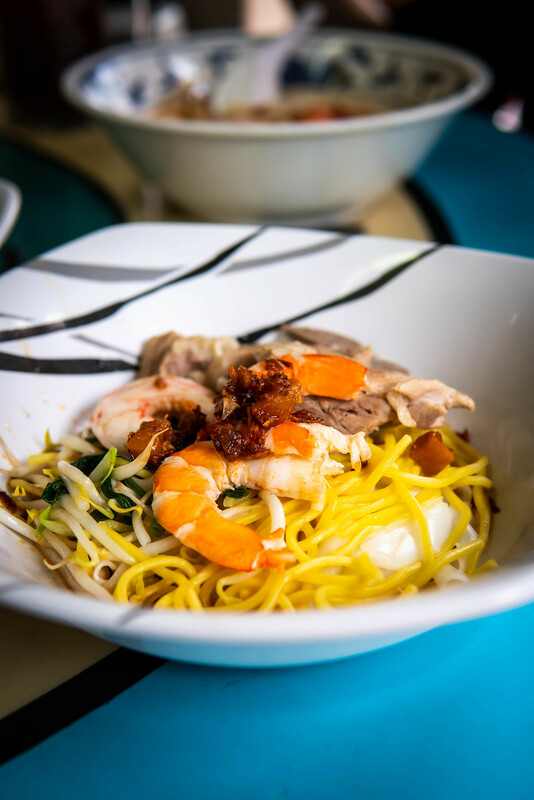 It also serves a variant of prawn noodles with larger prawns but, of course, this commands a steeper price that starts at $13 for a small bowl. I ordered the Big Prawn Noodles ($15) with beehoon and it came with large prawns that have been halved, kangkong and beansprouts. The large prawns were plump and had a good bite. However, I think the star of the show is the prawn broth! The prawn broth was not super rich, but it was lovely and carried a slight tinge of sweetness. I felt that the beehoon soaked up the prawn broth really well. One should note that the prawn broth is served sparingly and treated like a precious commodity, so soup refills will not be entertained. There was a signage at the front of the store even indicating so! I think that alone speaks volumes about Da Dong’s prawn broth. The soup broth was tasty to the last drop. It was simply irresistible! I learned from Watson that he wakes up in the wee hours of the morning just to prepare the prawn broth! 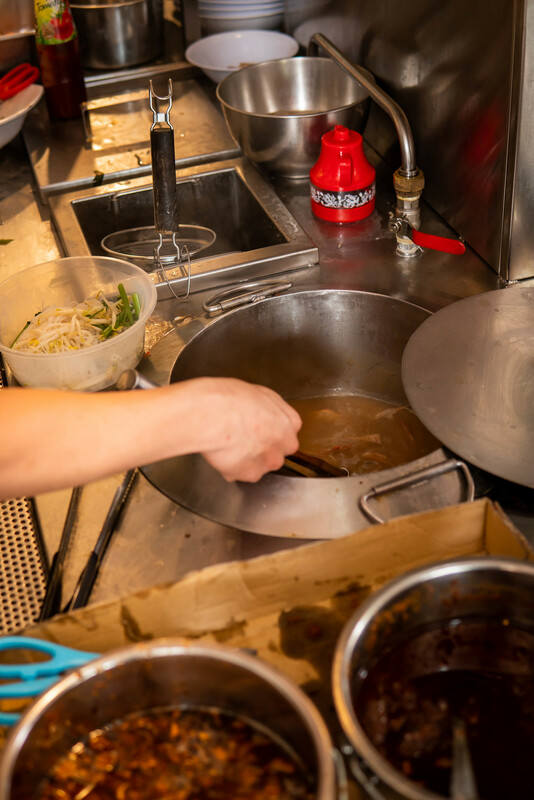 Preparation for the prawn noodles begin way before the stall opens at 7.30am. Watson told me that he begins making the broth from as early as 4 in the morning! I also had the dry Pork Rib Prawn Noodles ($8). It comes with a small bowl of the delectable prawn broth, and a few pieces of prawns and pork ribs. Crispy fried bits of pork lard topped the prawn noodles as well. The pork ribs were also fall-off-the-bone tender and I thoroughly enjoyed every morsel of the pork rib! However, I wished that the pork ribs were slightly larger in size. 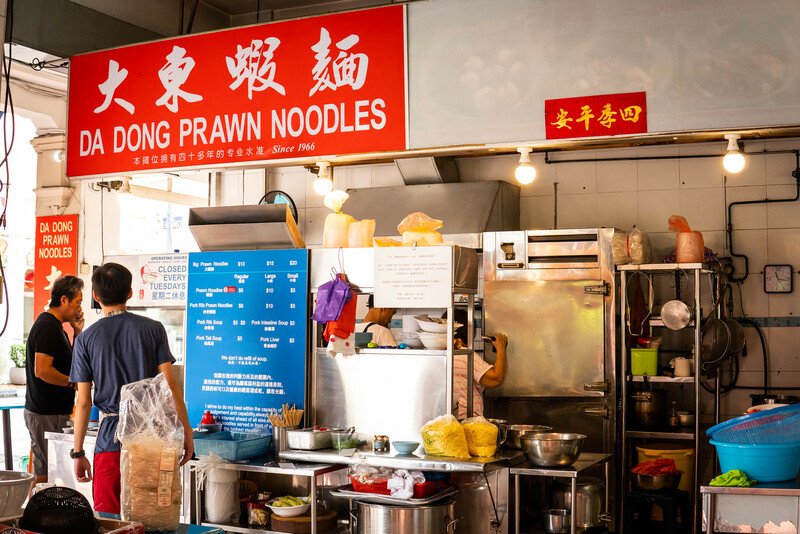 The prices of the prawn noodles here may repel some, but if you take into consideration the quality and size of the prawns and how tasty the prawn broth is, I believe you’ll think that the price is justified. Opening Hours: Wednesday to Monday, 7.30am - 2pm. Closed on Tuesdays. A sucker for good food & travel. Needs coffee to function. Can be bribed with kopi or kaya toast (or GrabRide discounts). Cat lover.